Q: I would love to hear any thoughts you may have for making the most of small kitchen. We live in a very large century home but it has a ridiculously small kitchen. A: My kitchens have always been on the small side. But even a tiny kitchen can feel bigger if its surfaces are kept clear. I don't like anything on the countertops, not even a crock of wooden spoons. I would rather have fewer things stored out-of-sight than a full kitchen with clutter showing. 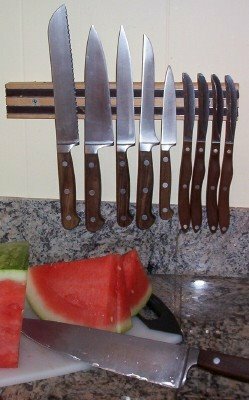 Our knives are hung on a magnetic strip on the wall. We have a small coffeemaker bought specifically to fit inside the cabinet when not in use. Extra food supplies are stored in select spots adjacent to the kitchen (see the peanut butter jars under the skirted entry table!). Cookbooks are shelved a few steps away in the family room. Supplies that don't pertain to cooking--like paper and tape--are stored in the study. What looks spacious, feels spacious--and an empty counter, however small, is ready for the serious work of a busy kitchen. Another bonus: streamlined kitchens require less stuff (and less money). I also have a small kitchen. I am considering using baskets. that will fit the depth of my cabinets. Then I can pull out baskets to access pans, canned food, and baking goods. I would love to have a pot rack,but I do not have the head room. I so enjoy your blog. Thanks! My kitchen seems a lot smaller than it is as there is usually a big puddle of a dog slap dab in the middle of the floor that you have to step over, walk around. And I keep finding myself saying, "Excuse me..."
I have a few small mirrors attached to the walls with those little strips.. it makes them hang flat and no holes! I can see the difference since I put them up - the reflections make it seem more open and bigger. Always enjoy your blog and check you 'bout every day. Hi Meredith--thanks for your helpful posts and photos here! I've linked. I would enjoy seeing more pictures of your counters and cabinets. I am grateful for the knife on the wall idea! Are those in kitchen/hardware stores? I am unable to come up with places to store things like the crock pot, canisters etc. Do you use tubs in the pantry for dry goods instead of canisters? I also cannot imagine putting away my big utensil crock, but maybe I will try it. I had to look in a specialty kitchen store for our magnetic strip several years ago ($14), but I have since seen similar strips at Sears and hardware departments for tool storage. I think it keeps the knives from knicking as in a drawer and saves the blind search of a typical knife block. I am converting our pantry over to Tupperware bins and canisters as I find them at yard sales. I like that they are stackable instead of countertop canisters, plus when I open them for a scoop, I can do it over the sink, saving myself a powdery mess later. Perhaps going without a utensil crock works best in a truly tiny kitchen like I have always had...I am only a step and a turn away from the utensil drawer. I find that stuff stays sorted easier in a drawer, even though it looks jumbled to the naked eye. Malakela, I like mirrored backsplashes, too. I did them in our first home because it reflected the sunny windows on the other side of the room. It doubled the light in that kitchen and made it seem bigger. This kitchen faces the wrong way, so I didn't bother. i too have a very small kitchen, made "smaller" by the fact that guests always come through the back door which is right in my work area! I have noticed, since putting up a wide fruit-printed border above the counter line, that it was a mistake to do so. Even with very few items on the counter, it now looks perpetually messy, as if someone forgot to put away the groceries! I keep most of my flours, spices in the freezer. Have NEVER used canisters just because of the clutter and always having small kitchen. Thank you so much for answering my request for help with our little kitchen! I really appreciate it. I took a look at my kitchen and realized that I have not one but two crocks with utensils, a mug tree, large coffee maker, carafe, basket, etc. etc.etc. all on my limited counter space....I am about to go and declutter now! I love the idea of baskets in the cupboards so you can pull them out to reach things. Mrs. Blythe - I have an odd shaped kitchen as well with a door to the basement and a door to the mudroom so there is no practical place to put a pot rack though that would certainly help if I had a space for it. Malakela -I have a big dog too that seems to just love the center of the kitchen for napping....I find myself saying "Beep Beep" more often than anything else somedays! Meredith - Thank you again and I will be praying for you and the little one! I too am a member of the dinky kitchen club. When I see double income no kids people with acres of kitchen I get all crabby. Anyway one thing I like is my undercabinet toaster. I must get me one of those knife strips! It seems so dangerous having them kicking around in a drawer, but I didn't know what else to do. I found a knife strip that looks just like this (12") at Bed Bath & Beyond for $14!